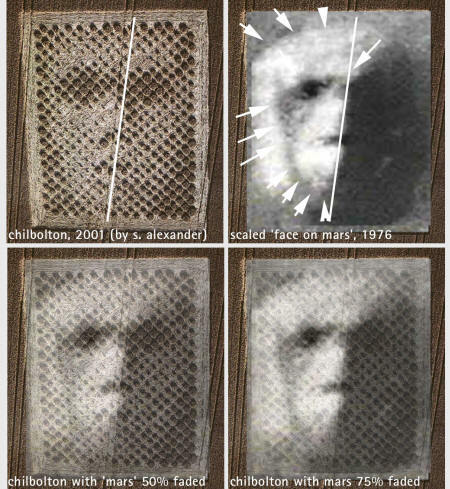 The image which confronted the Telescope personnel that morning bore a striking resemblance to the July, 1976 Viking image of the "Face on Mars" (below image) - right down to the appearance of asymmetry and "erosion" on the right hand side. Curiously (considering what was to happen next) this “Cydonia resemblance glyph” appeared just four days after our own publication of a provocative, new, comprehensive theory of Mars - our Mars Tidal Model Paper (that detail will become important later). Though first noticed by the telescope employees on the 14th, the Chilbolton "Face" was not reported (and NOT by the facility staff) until Sunday, August 19th. Its announcement in England caused an immediate worldwide sensation on the Internet - not the least, because it struck many observers as a deliberate effort to remind everyone of the infamous Face on Mars. 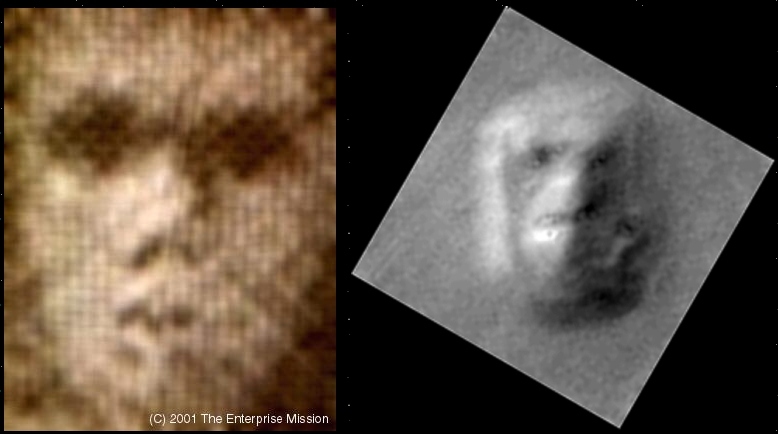 For one thing, the Face crop effort seemed to be designed to replicate the light and shading of the original Viking Cydonia image (below, right). 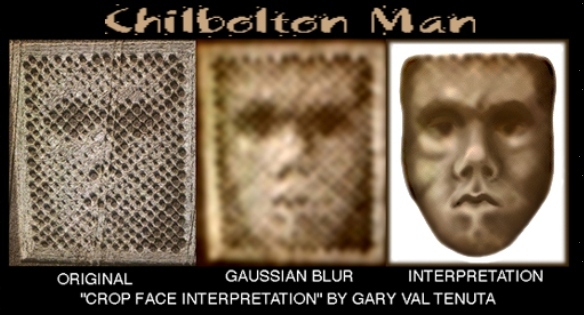 The Face turned out, under a "Gaussian blur filter" (thanks to Paul Lowrance - below, left), to bear a strong resemblance to a somewhat primitive human face - not unlike the left hand side of the human/feline hybrid of the Face on Mars ... if the Face’s erosion was removed. But, the Chilbolton glyph lacked a key feature of the Cydonia Face - the distinctive "platform" around the base. In place of this, however, it was obviously carefully placed within a frame (see above). Was this done to underscore its connection to the prior Viking pictures? But there were other, far more sophisticated aspects, which drew people to this glyph. The whole thing seemed to be made up of cells, which bore a striking resemblance to the half-tone “dots” used to create newspaper pictures, or the pixels of a digital image. These "pixels" were made up of a series of darker standing tufts of wheat, with the bright "pixels" created by the gently swirled down stalks between (below). The deliberately-created illusion in this glyph (below) -– that the lighting is coming from the upper left (as in the original Viking Cydonia frame), when in fact Steve Alexander’s aerial photograph was taken with the sunlight on the field coming from the lower right - is further testimony to the superb optical physics embodied in this effort. 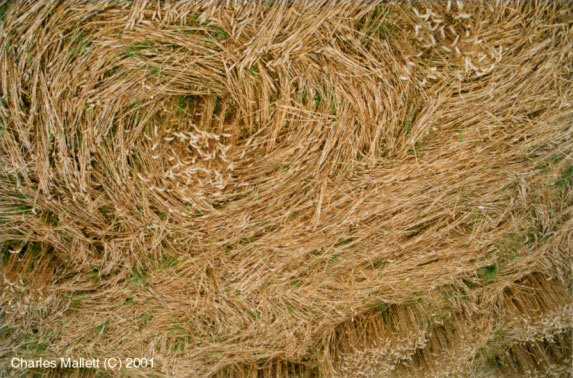 And, remember - -this was achieved in a waving field of wheat, not the most permanent medium to work with. And there was another "cute" touch: the Face glyph was placed in the field in such a way that the “tramline” scanned across the “nose” cuts it almost exactly in half - another subtle reminder of the dual-Face image at Cydonia? Yet there are other reasons to take this possible "Chilbolton-Cydonia" link seriously. As noted previously, precisely a year before the “Face glyph” was created in this English field, another glyph suddenly appeared (below). 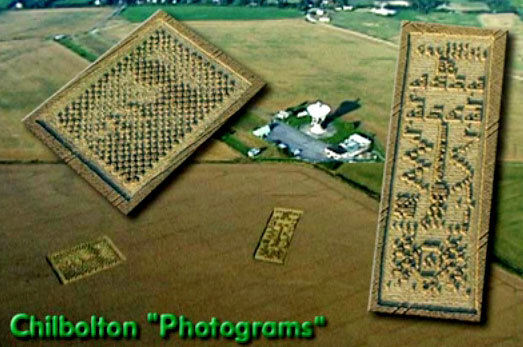 Michael Lawrence Morton, carrying on the work of Carl Munck (first presented by Richard C. Hoagland at the UN, in 1992), found a stunning "geometric matrix" connection between these two sites - the Chilbolton field and Cydonia. 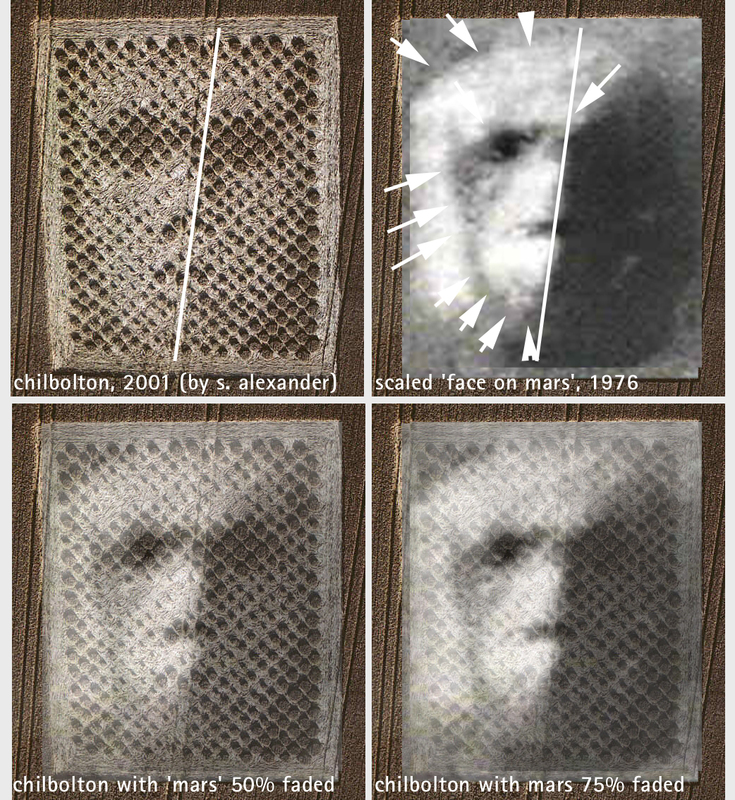 In fact, in decoding the location of the fractal glyph from the year 2000 (below), Morton determined an astonishing set of linkages on his grid system between Chilbolton and literally the Face on Mars itself. But why there… and why now? 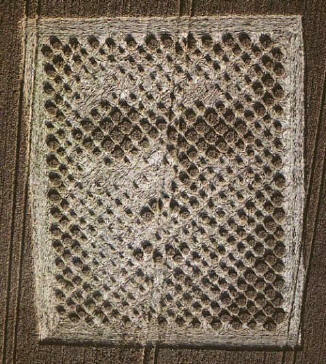 According to Manager Ladd, five days after the Face initially appeared, a second striking - and strikingly different - glyph suddenly materialized in the same field (below) - only a few hundred feet from the "Face." But this second glyph, at first dubbed the "Persian carpet," had a far more compelling story to tell than the mere appearance of “a “face.” Crop circle investigators in England quickly realized that this second glyph was a near dead ringer for a “SETI” (Search For Extraterrestrial Intelligence) message composed and transmitted from the Arecibo Radio Telescope in Puerto Rico in 1974 - 27 years before and thousands of miles away from this Chilbolton field (below, left). That original Message, conceived by Frank Drake, the late Carl Sagan, and a few other colleagues at Arecibo, contained information about the human race, our solar system, and our means of communication. Yet, after a second look, there were subtle but crucial differences between this historic SETI transmission, and the apparent “alien response” appearing at Chilbolton in 2001. The obvious question that’s been on everybody’s mind is: “Are these for ‘real,’ or a just clever hoax?” Since the first appearance of “crop circles” in England, in the early 1970’s, this question has hovered over every new appearance... now numbering in the literal thousands. But, since there are no scientific studies of the plants from the Chilbolton glyphs as yet, what other clues can be used to ascertain the probability that something truly remarkable has happened there? not claim credit for it afterwards and not offer to show skeptics just how they did it by being willing to quickly reproduce the same designs within a pristine area of a wheat field while under the watchful eyes of veteran crop-circle researchers. Concerning the probability of (b), since most of the crop-circle formations apparently do get noticed, including hoaxes, so would practice attempts be noticed and reported as either genuine or hoaxes. Surely several practice attempts would be needed in this case, and this would give away hoaxers' final version unless they trampled down each practice attempt right away after making it, without being noticed. However, such trampled areas would themselves likely be noticed from the air and/or the perpetrators reported. I estimate the probability of such going unnoticed and unreported as less than 50-50, say 0.3. Concerning the probability of (c), I notice that there are some 700-1000 right-angle corners of standing stalk involved, on a relatively small scale, in all those binary units of the "returned" Arecibo message. It would be difficult to generate even 30 of them without making a mistake - and once a mistake is made, with the wrong stems bent over to stay, they can't be raised again. If the chance for error was only 0.5 (50-50) for each succession of 30 corner units, then the probability of making just one right-angle corner come out right is quite high, 0.9782. However, the probability of one or more persons continuing the process on 800 of them without botching any of the corners or trampling down the wrong spot would be this figure raised to the 800th power, which is only 2 x 10-8 = p(c). 45 minutes to remove all stakes and cords and carefully exit without leaving access tracks behind in the field. This is some 31 hours, suggesting the need for a team of 5 or 6 people, each knowing what their specific tasks are. Since this seems possible, this consideration doesn't rule either against the hoax or against the "real thing," which means p(d) = 0.5. Concerning (g), I believe the chances are less than even that, if hoaxers had made such unique crop glyphs, they wouldn't wish to claim credit for it (or them) within a couple weeks afterwards - after a goodly number of paranormal researchers had offered their opinions that the formations were not man-made. This hasn't happened. So I would estimate p(g) = 0.4, with this value decreasing somewhat as time rolls on without any viable confession forthcoming. That is - less than two chances out of 10 billion (U.S. billion). So why is the “hoax” hypothesis given any credence at all? E.g., UFOs that look somewhat like airplanes except the navigational lights are all wrong and perhaps no wings, or black "helicopters" flying way too low and perhaps making no noise whatever, or crop-circle formations that start out simple and become more complex (as if hoaxers were teaching themselves), etc. Surely we have to allow that since they could be millions of years advanced over us in their evolution and science & technology, they could also be a bit smarter than us, and have a strategy of dealing with us that includes some feature(s) in their sightings/glyphs that will allow skeptics a way out from believing what they are incapable of believing without going berserk. Hence, if such "mistakes" were indeed present in the glyph, they do not support the hoax hypothesis any more than they oppose it, and do not enter into the above probability analysis. Obviously, the answer one gets with such a probability analysis depends entirely on the individual probabilities estimated for the independent components of the hypothesized hoax. If you were to do it, your numbers would no doubt be different, yet still yield an outcome of very slim odds of success for a hoax, I'll wager. But it is handy to have a formula by which you can obtain an overall probability estimate after the individual probabilities have been hashed over and agreed upon. “… The 'face' and the 'message' at Chilbolton presented different clews [from the previous Milk Hill formation]. The farmer, at my request, when harvesting the field, lowered his harvester cutting boom to approx 1 inch above ground level. In my experience, this is an excellent method of finding underlay. What I found was VERY revealing indeed. Each pattern was set out first using a very accurate grid on which the designs were then formed or made. I will show photographs of the under lay later …. What we saw was a beautiful grid, all visible after the overlay of flattened plants had been cut and removed by the harvester. To begin with, the digital “pictogram” (below, right) is the product of two Prime numbers: 23 and 73. This sets the “raster” of pixels - 23 across and 73 down. 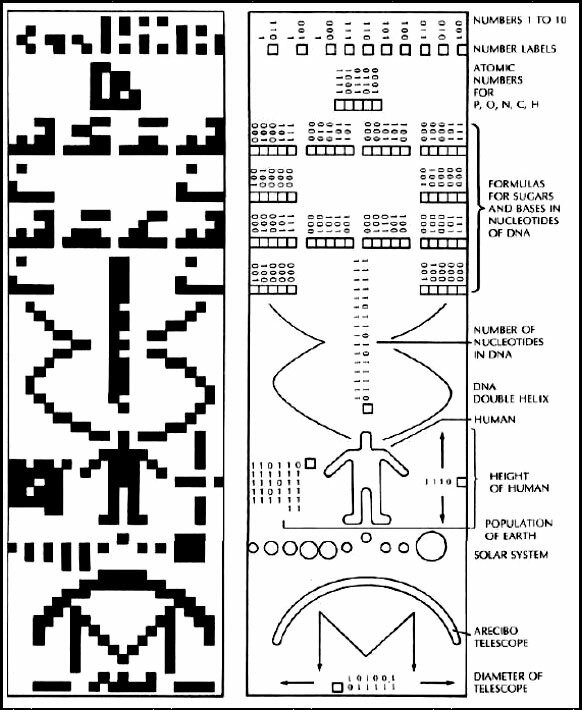 The last, curved symbol at the bottom of the array is our means of transmitting the Message: a schematic of the Arecibo radio telescope itself - complete with binary scale (below it) to communicate how large it is. ‘Here is how we count from one to ten. Here are five atoms that we think are interesting or important: hydrogen, carbon, nitrogen, oxygen and phosphorus. Here are some ways to put these atoms together that we think interesting or important - the molecules thymine, adenine, guanine and cytosine, and a chain composed of alternating sugars and phosphates. These molecular building blocks are put together to form a long molecule of DNA comprising about four billion links in the chain. The molecule is a double helix. In some way this molecule is important for the clumsy looking creature at the center of the message. That creature is 14 radio wavelengths or 5 feet 9.5 inches tall. In the crop glyph “response” that appeared a few days ago (below), there have been some changes made to the original Message. So, what about those changes? 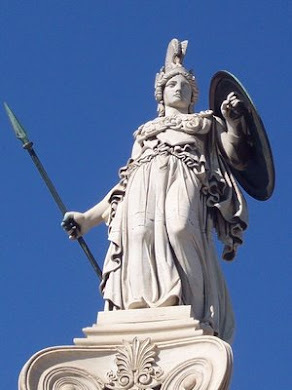 To begin with, the first line - the decimal equivalents of the binary code - were unchanged. But the atomic numbers of the elements composing the basis of Life had been altered: silicon, an element with an atomic number of 14, was added precisely in the correct sequence - between oxygen (atomic number 8) and phosphorus (atomic number 15). This was a most curious and significant addition. However, additional work by other researchers - such as Dustin Brand, a software engineer highly familiar with binary coding who painstakingly compared both multiple aerial and ground photographs (below) to create a precise two-dimensional “grid” of the “Arecibo Response” - has revealed some basic errors in Paul’s original mapping and decoding. To begin with, the first line - the decimal equivalents of the binary code - were unchanged from the Arecibo original. But the atomic numbers of the elements composing the basis of Life had been altered: silicon, an element with an atomic number of 14, was added precisely in the correct sequence - between oxygen (atomic number 8) and phosphorus (atomic number 15). This was a most curious and significant addition. Because… in 1969, the late Ben Volcani - a renowned microbiologist at the Scripps Institution for Oceanography - discovered the crucial role of silicon in carbon based Life. His work and that of his colleagues (like Charles Mehard, also at Scripps, and Edith Carlisle in the early 1970’s at UCLA) showed that the presence of silicon is critical in a variety of terrestrial life forms, as well as human cell structure: for instance, in the binding of the cartilage and mineral aspects of bones. Without silicon, we would have rubbery, bendable skeletons - and probably couldn’t even stand erect in Earth’s gravity at all. The point is, unlike the claim made by the current SETI's Seth Shostak in his ‘Coast-to-Coast” radio debate with the author, that the presence of silicon in the response glyph is just "science fiction," silicon is a crucial but almost unknown ingredient in the terrestrial “soup of life.” And it is a rock solid certainty that Drake and Sagan did not know this - otherwise, why exclude it from their own Message? Moreover, whoever created this glyph was clever enough to add this crucial but subtle difference. Our answer: because the terrestrial criticality of silicon is NOT represented in our DNA - but in other proteins and enzymes making up the molecules of Life. Reading the original Arecibo selection, listing “hydrogen, carbon, nitrogen, oxygen and phosphorus” as applying ONLY to the DNA itself, is just too limiting - as the Scripps research now proves. It is our reading that whoever composed the “Arecibo response” at Chilbolton may have been gently trying to expand our 1974 biochemical awareness. And, in fact, Neal Sullivan - a Scripps graduate student at the time - demonstrated (simultaneous with Volcani’s work) that silicon is essential in the production of DNA-polymerase - an enzyme required for DNA synthesis in diatoms. And diatoms (which come in literally thousands of varieties - one of which is pictured below) are one of the photosynthetic marine organisms lying at the base of the food chain of all life on Earth. In 1997, Mark Hildebrand, a marine biologist at Scripps, announced a critical extension of Volcani’s work - isolation of the specific genes responsible for the role of silicon in diatoms. In contrast to the apparently unchanged listing of sugars and bases in DNA itself from the original to the glyph version, the center vertical column - denoting (again in binary code) the total number of nucleotides in the human genome - has been changed in the crop version: there are significantly more nucleotides in the “alien” DNA. The difference has to be linked to another key change in this same section of the “message”: the twin DNA “double helix” strand depicted in the original, is asymmetric in the glyph; the left hand side appears to be a triple helix - as if communicating some key differences in the sender’s genetic make-up. Is this “triple helix” in the glyph trying to tell us that some “aliens” performed similar “genetic engineering” experiments on humans… some time in the past? 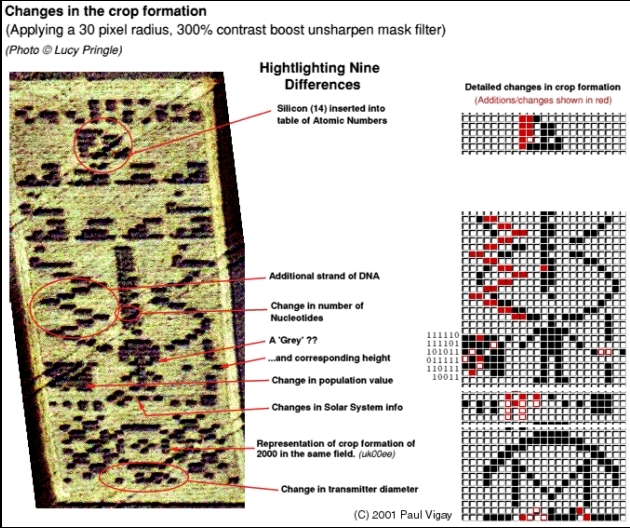 This theory is consistent with the enhanced number of nucleotides in the “response” human DNA section (above the counterpart to the human figure in the Arecibo original); for this alteration in the crop glyph seems to refer directly to the humanoid figure depicted just below this crucial sequence. In place of the “human figure” in the original Message, a small bodied, big-headed figure - resembling a classic "gray” - has been carefully substituted in the glyph version… complete with a binary code denoting its apparent height (about 3.3 feet). I had to work hard for several days, to discover that the single-stranded helix with 6 bases per turn refers to 2', 5'-linked RNA or DNA, as opposed to the normal 3', 5' variety. This is known to hardly any molecular biologist, and I found out only by making an accurate model. Since the chemical formula of the 6-base helix remains the same as before, I guessed that any difference might be one of stereochemistry: change the sugar-phosphate connection. A tiny single-digit change in the central "rod" of that pictogram, located between the two nucleic acid strands, may confirm such a change in stereochemistry once it is mapped accurately. "Association of 2', 5' ligoribonucleotides," Nucleic Acids Research 1992, vol. 20, pp. 1685-1690. This paper shows that 2', 5'-linked RNA will form double helices, but prefers to remain single stranded. "Synthesis and biological activities of 2', 5'-oligoadenylate," Nucleic Acids Research 1995, vol. 23, pp. 3989-3994. This paper explores the use of 2', 5' RNA as an antiviral drug; it seems we have been exposed to such strange molecules in the past, and have evolved an interferon-RNAase L system against them. "2', 5' linked deoxyribonucleosides: thermal stability", Nucleic Acids Research 1997, vol. 25, pp. 3310-3317. This paper shows that 2', 5' DNA will form a double helix with RNA but not DNA; hence any 2', 5' infectious agents would not be detectable by PCR. “Recall that origin-of-life experiments in the 1980's [?] by Leslie Orgel, found that RNA would often polymerize into two different forms, namely 2', 5' versus 3', 5'; and it was a mystery to chemical evolutionists why 3', 5' was favored on Earth. Note that many abductees [remember, the central figure in the “response” version of the Arecibo Message looks like a classic “gray”] remain ill with chronic fatigue, which generally includes a high level of RNAase L; just as if their immune systems have been activated by contact with 2', 5' RNA. The clear implication is that 2', 5' RNA may represent an alternative system of genetic coding to 3',5' RNA or DNA as found on Earth; and that the makers of the Chilbolton pictogram wished us to understand that fact [emphasis added]. Whether a secret band of elite scientists could hoax such a result seems doubtful; since 2', 5' nucleic acids are mentioned rarely in the literature, and nowhere does it say that they form a single-stranded helix with 6 bases perturn, that I found only recently, by painstakingly constructing an accurate model. “If the message is authentic, one must wonder whether it was sent by radio some time ago, yet not made public? Finally… let me suggest a ‘return message’ that could open communication rapidly. I suggest that you ask people all around the world to write the following in deserts, beaches, forests, crops, and on all frequencies of amateur radio: ‘2', 5' ---6 ‘… ‘3', 5' --- 10 ‘ Or simply ‘6 /10’ if they are lazy. 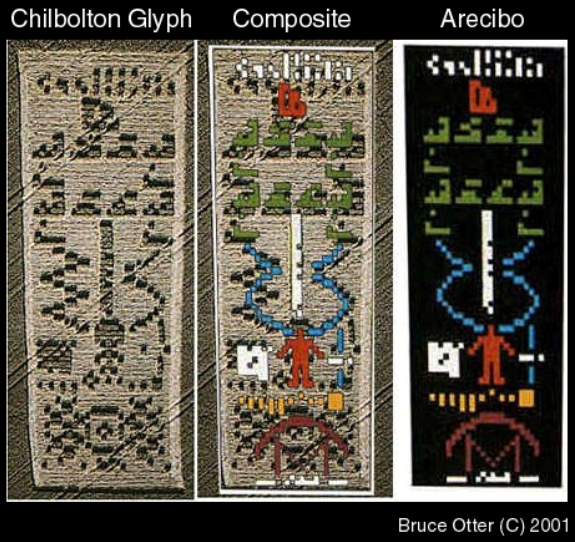 If the single/triple helix DNA representation in the Chilbolton glyph seems confusing, it is no more so than the Arecibo Message itself. The intensive examination of Drake and Sagan’s original “binary message” by so many on the Internet has now turned up certain puzzling “errors” in the original 1974 Arecibo transmission. Most (but not all) of these seem to be concentrated in the coded description of terrestrial DNA. DNA is one of a vast group of organic (carbon-containing) molecules known as “polymers.” The sub-molecules of DNA (monomers) are called “nucleotides.” The entire DNA polymer, comprised of varying numbers of nucleotides (depending on the complexity of the life form) is known as a "polynucleotide." Each nucleotide in this polymer consists of a 5-carbon sugar (deoxyribose), a nitrogen-containing base attached to the sugar, and a phosphate group. There are four different types of nucleotides found in DNA, differing only in their nitrogenous base. 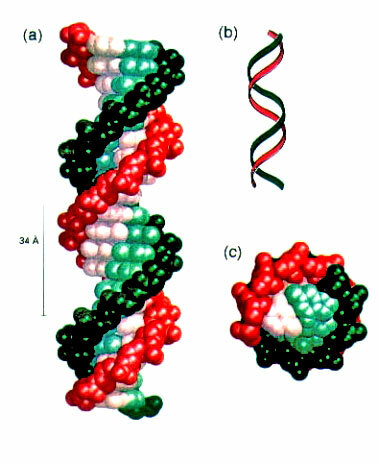 Model of a double-helical DNA. One chain is shown in green and the other in red. The purine and pyrimidine bases are shown in lighter colors than the sugar-phosphate backbone. (a) Axial view. The structure repeats along the helix axis (vertical) at intervals of 34 Å, which corresponds to 10 residues on each chain. (c) Radial view, looking down the helix axis. Some investigators have now claimed to have discovered serious errors in the binary coding of several of these crucial monomers in DNA in the original Arecibo Message. They insist that “mistakes” seem to have been made in the basic binary codes for Deoxyribose, Adenine, and Guanine. 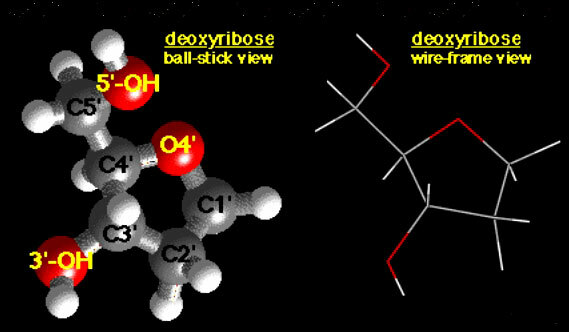 Deoxyribose (below) has five Carbon atoms, but the binary coding for it in the Arecibo transmission shows seven carbon atoms. Similarly, Adenine has five carbons (below, left), but it’s binary designation in the Message shows only four. Guanine (below, right) contains five carbons, but in the original Drake/Sagan Message there are again only four carbon atoms shown. Because of bonding, within the polynucleotide DNA molecule itself (as opposed to it in isolation) Adenine contains only four hydrogen atoms (two attached to a nitrogen and one each attached to a carbon) - but, remarkably, the Arecibo Message illustrates it with five hydrogens. Now, if you’re claiming to send the genetic code of the life forms on your own planet to a completely alien species (which may have a genetic code based on molecular sequences completely different from what we know as “DNA”, such repeating nucleotide errors would simply make it impossible for any alien recipients to successfully unscramble your genetic code, let alone the basis of that code. Hoaxers? For a radio transmission aimed at a globular star cluster some 26,000 light years distant?! Just who could possibly successfully “hoax” any received radio response? And when… in 50,000 years!? In fact, these apparent “errors” in the Message are explained quite simply: they come from the fact that these nucleotides are NOT “free molecules” (as these investigators have erroneously assumed) - but are bonded in the larger DNA molecule itself. If their amalgamation into the DNA polymer is properly deduced (from other aspects of the binary), the apparent “missing atoms” in these “isolated” nucleotides is completely understood. A far more serious problem is the addition of “silicon” to the list of elements in the glyph. As noted previously, one can’t help wondering - based on Ben Volcani’s and his colleagues’ work - what happens if you now insert silicon directly into those “erroneous” nucleotide sequences? 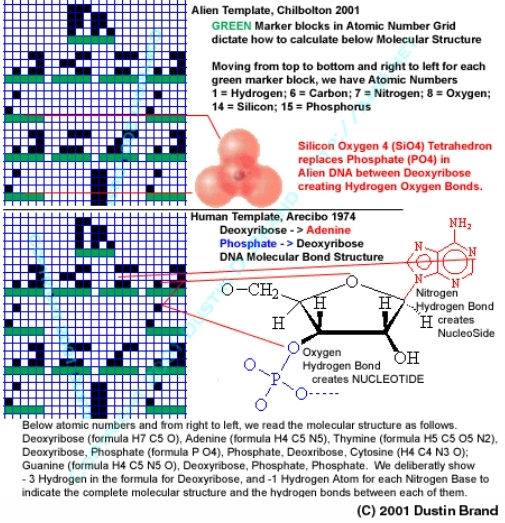 a plausible “alien” DNA chemistry, based on a careful tally of the information in the glyph, utilizing a silicon-oxygen tetrahedral molecule in place of the phosphate in our DNA (graphic, below). The formulae for the molecular structure that make up every single DNA strand remain identical to the human template, with one exception. In Alien DNA, the Phosphate ->Deoxyribose (Sugar) Hydrogen Bond is replaced with a Silicon Oxygen 4 (Tetrahedron) -> Deoxyribose (Sugar) Hydrogen Bond. This is directly connected to the Aliens inserting Silicon in its proper place in the Atomic Numbers Grid. This indicates knowledge of the Deoxyribonucleic Acid strand, and the basic fundamental properties of life on earth. The exact formulas for the molecular DNA structure that form each link in a DNA strand are as follows. Deoxyribose C5OH7; Adenine C5H4N5; Thymine C5H5N2O2; Phosphate PO4 (in Human DNA) - Silicon Oxygen SiO4 (in Alien DNA); Cytosine C4H4N3O; and Guanine C5H4N5O. The molecular structure of the DNA is demonstrated by the repeating pattern of DeoxyRibose and Phosphate (a Nucleotide) or Silicon Oxygen 4 on both the right and left hand sides of the templates. The Molecular DNA Bases each form a NucleoSide with the Deoxyribose, and then a Base Pair with each adjacent Base. The Alien DNA change is evident in the Binary ->Decimal conversion of the Alien DNA Data, which = 4,294,966,110 DNA Sequences or links or base pairs. This is a + 524,288 from the human DNA number which is 4,294,441,822. The human genome project currently estimates 3.5 Billion Base Pairs or links in human DNA. This is an interesting fact because in 1974, and according to Frank Drake and quotes by Carl Sagan, we sent our human DNA base pairs number indeed as about 4 billion - NOT 3 billion. Below the line containing the distorted “gray alien” figure in the glyph, lies the “solar system” code - also NOT in binary, but as a simple line schematic. From right to left, the glyph version also has a “sun” and two “inner worlds” (below). This is followed by three elevated icons, indicating that three worlds in the sender’s “solar system” are/were inhabited. One of these is, in fact, not a “pixel planet” like the others but a blank space surrounded by four black pixels at right angles. This is another controversial aspect of the “message in the wheat.” Does this “alien solar system” represent a different star and planets… “theirs?” Or, is it in fact, our own - but at a different time… the past?! Again, leaving aside for a moment the sticky question, “Who sent this message - genuine extraterrestrials, or humans?,” we are tending to believe at this point that the “altered solar system” depicted in the glyph refers in fact to this one… but sometime before 65 million years ago. There are several reasons for this inference. First, it would be extremely coincidental to also have two inner planets, counterparts to Mercury and Venus, in our first “alien” communication of another solar system. Recent studies of more than 60 extra solar systems have revealed, with only a couple of quasi-exceptions, NONE which even begin to resemble our own. The second reason for believing this is our own system, lies in the “twin planets” in the glyph. Since Pluto is thought by many astronomers now to be either an escaped moon of Neptune or merely an errant member of the so-called “Kuiper Belt” of outer solar system asteroids (which at one time wandered too close to Neptune and has been captured in a peculiar “resonance pattern” with that planet), if the depiction of the system is from before this “escape/or capture event,” then the remaining outer planets should correspond to the two “twin outer planets” in this solar system - Uranus/Neptune, and Jupiter/Saturn. An alternative interpretation is that this line represents this solar system with additional, now missing members… including an unknown fourth and fifth planet, the latter orbiting where the current asteroid belt resides. As noted earlier, the timing of this glyph is startling - and highly “suspicious.” In our recently published “Tides” paper, the original fourth and fifth planets have been destroyed. This destruction then releases Mars (a satellite of one of these former worlds) to become a new “fourth planet” on its own. This identical scenario eerily seems to be depicted in the Chilbolton glyph. Why? And… why NOW? It is the explosion/collision of the fourth and fifth planets 65 million years ago which, in our model, result in the literal vaporization of the bulk of these two planets, and the few orbiting fragments we see as current asteroids. Of course, such a catastrophe would have been devastating to any life/populations of these former worlds (depicted in binary in the glyph as “upwards of 12 billion”). In such a horrific scenario, these catastrophic events might have triggered a desperate attempt to survive by sending refugees to Earth (the only inhabitable planet remaining in the solar system). So, is the glyph trying to tell us that an effort was made to implant the dying populations genetic code in terrestrial life forms here on Earth - thus accounting for the inference of “genetic engineering” higher in the glyph… ultimately resulting in ourselves? But, we suspect there’s more …. If you compare the 2000 formation with the 2001 “schematic,” you’ll note some significant alterations. 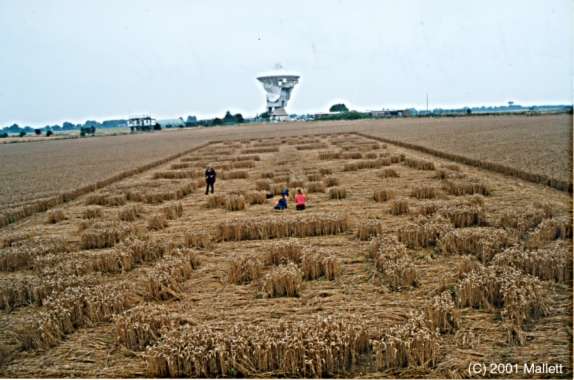 In place of the central “dot and double ring” formation in the 2000 Chilbolton crop circle (below), the center in the “Arecibo Response” is another blank “pixel” - surrounded by four dark “pixels” at right angles… exactly like the last “raised planet” in the solar system line above it. It has been our supposition for some time that the exquisite array of real “crop glyphs” (denoted by altered molecular compounds, physiological changes in the plants, the appearance of rare radioactive isotopes, etc.) have been created by the technological application of some form of Hyperdimensional Physics to the living plants. This suspicion has been reinforced by peer-reviewed papers scientifically documenting these mystifying phenomena, published by among others, Dr. W. C. Levengood (“Anatomical Anomalies in Crop Formation Planets,” Physiologia Plantarum 92:356-363, 1994; “Semi-Molten Meteoric Iron Associated with a Crop Formation,” Journal of Scientific Exploration, Vol. 9, N0 2, pp. 191-199, 1995), and Dr. Eltjo H. Haselhoff. This theoretical connection was backed up years later by our discovery of the experimental work of physicist Bruce DePalma. As we have written elsewhere, HD Physics above all is a physics of rotation. DePalma’s decades of remarkable experiments in basic science specifically focused on “anomalous rotation”… and its associated anomalous energy production. But it was at a Tesla Society Conference in the 1980’s where DePalma first publicly described some remarkable rotational experiments involving living systems - and where the potential “connection” between his earlier work - and the production of “crop circles” - came together. “DePalma also showed one of his original suspended gyroscopes which showed a distinct variation in the weight and movement of a spinning mass long before the Japanese experiment which gained so much publicity. Bruce told of one of his experiments which used grass as a gravity detector [emphasis added]. He built a mount above a rotating phonograph turntable which held a pie pan with earth and grass seed. When the turntable spun, it caused the grass to grow higher. A large weight was added to the turntable, the grass grew even higher as if the gravity in the area were somehow reduced. “Another experiment using a similar technique was to mount the pie pan holding the earth and grass seed directly onto the spinning turntable. “As the turntable spun, the grass grew higher than normal and slightly in TOWARDS the axial shaft of the turntable, this EVEN THOUGH THE PAN AND THE TURNTABLE WERE NOT PHYSICALLY CONNECTED. And, why was the same glyph now carefully placed at the bottom of the “Arecibo Response” in precisely that same location in the field? And why did this small replica appear to contain at its center exactly the same 90-degree arrangements of “pixels” as the planet in the solar system line above it? Was the “sender” of this “Arecibo glyph” attempting to illustrate schematically a deep connection between the Physics which can create a genuine crop glyph… and the same physics which can cause entire planets to explode?! These are still in large part “educated guesses” - especially the interpretation of the “solar system,” the potential communication of “genetic engineering,” and the true nature of the “alien being” depicted in the glyph. At the very least, the sudden appearance of these two remarkable formations in the field at Chilbolton - an archaic, human-looking “face” deliberately reminding us of our own evolutionary past… and Mars, followed by an eerie “response” to the 27-year-old Arecibo Message - finally seems to be a not-so-subtle-attempt at direct communication of critical information about US - as many of us have noted, a startling departure from any previous “crop glyphs” of the past 26 years. The key question is, of course: from whom? Thirty years ago, Eric Burgess and I were fortunate enough to be in the right place, at the right time, to suggest to Carl that the first spacecraft from Mankind destined to escape the solar system - Pioneer 10 - carry an historic “Message from Mankind” (below). Carl kindly acknowledged that genesis in SCIENCE, March 1972. Three years later, Sagan and Frank Drake created the second “message” to be deliberately sent into the Galaxy - the now famous Arecibo radio transmission of 1974. Having had this experience with “interstellar messages,” it is my opinion - based on a careful review of all the evidence presented above - that the Chilbolton glyphs are NOT an “alien answer” to the original Arecibo transmission of some 27 years ago (or, even to their deliberate rebroadcast from a Russian Radio Telescope facility two years ago. Colin Andrews’ first-hand report from Chilbolton (above) certainly supports this theory. I also believe, however, that they ARE an important, new “communication” from “someone” who wishes us to consider (at this crucial moment in our history - 2001 …) some very new important information about the entire field of “extraterrestrials” - and who has known what… and for how long. 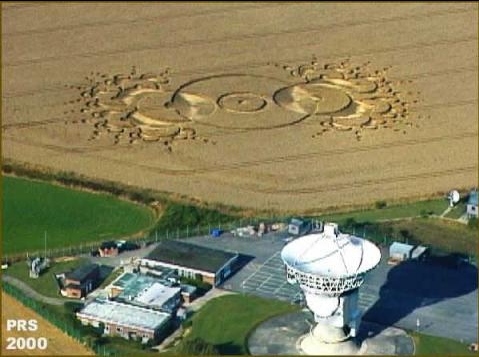 So, if they weren’t made by “ETs” - who did create the Chilbolton glyphs… a literal “stone’s throw” from a 1960’s British radio facility, sitting on MOD (Ministry of Defense) grounds? Who indeed …. How about… “someone in the black intelligence community”… also equipped with HD technology, capable of making “genuine” crop glyphs? Now, a month later, EQ Peg was back! In a couple days after the original October 26th posting, the story leaked that the “amateur radio astronomer” was actually a British engineer named “Paul Dore,” and that he worked for “a major British aerospace company.” Over the next few days, a remarkable drama played itself out electronically around the world - with some folks believing the “Dore” discovery was real, others instantly dismissing it as a hoax. Additional “amateur” confirmations were soon posted on the “Dore website, only later to be removed because they proved to be outright hoaxes - using stolen identities of real amateur astronomers elsewhere in the world! He based his dismissal on two facts: the signal was NOT on the original frequency posted by “Dore” - 1453.1 MHz; and, the source picked up by the ATCA array was “several degrees away from EQ Peg.” Since the standard SETI paradigm is that “ET” will “phone from home ,..”, the idea that the source could be moving and changing frequency (which would imply it was close-by, and decelerating… toward Earth) was simply unthinkable. Simultaneously, another Britisher - claiming to be the REAL “Paul Dore” - popped up on the Internet, vehemently claiming that the entire affair had been a hoax… with HIS stolen identity ... and that we’d done it!! That possibly, a group of “insider” dissidents - who wanted to get key information made public, either as a “test” of our reactions to an imminent SETI contact… or as a means of “leaking” real information on an imminent hoaxed “landing of an incoming interstellar probe” -– had staged the entire “Dore Affair” simply to “blow the cover” on the operation. This assessment was based, in part, on independent “inside” information I had been given from a DOD source months before, regarding just such a bizarre scenario. After “Dore’s” sudden cancellation of the November 4th press conference, which not only mentioned direct involvement of both British and American intelligence agencies, but also made curious references to “bad weather,” we posted a detailed “decoding” of his rambling e-mail… with some surprising results. Remarkably, everyone who attempted to seriously probe into the EQ Pegasus affair was either immediately tarred with the “hoax” brush themselves, or promptly (after beginning their investigations …) claimed it was simple “interference” and not worth scientifically pursuing. Both radio professionals and amateurs alike (the SETI League, for instance) exhibited a remarkable lack of curiosity over the details of this “detection” - even after ATCA’s independent confirmation of “something” intriguing out there - and promptly also refused all further discussion of the signal. I even had a trusted friend and senior radio astronomer (formerly under contract to NASA on a major planetary mission), refuse further contact with me… after he made a few exploratory phone calls to other colleagues on the subject (I’d quietly asked him for information on any additional NASA or professional radio astronomy confirmations of the EQ Peg signal, apart from Australia). Then, just when it couldn’t get much weirder ... the entire “Dore” website disappeared, replaced with a site containing the logo of the National Security Agency… and MY initials at bottom! 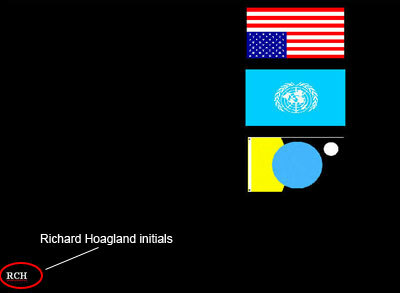 Shortly, that page disappeared, to be promptly replaced with another… this one sporting three upside down flags (universal symbols of “distress”) ... with my initials still in place (click below image). In the end, it seemed that we had all been involved in some kind of bizarre “intelligence” operation. And, at least part of it seemed to have specifically targeted Enterprise… But - to what end? There are now unmistakable overtones of this infamous 1999 “EQ Peg Affair”… surrounding the current 2001 Chilbolton glyphs. First: the location is essentially at a government-contracted facility - dealing specifically with “radio communications” and with “weather”… both key subjects of the EQ Peg soap opera two years ago. 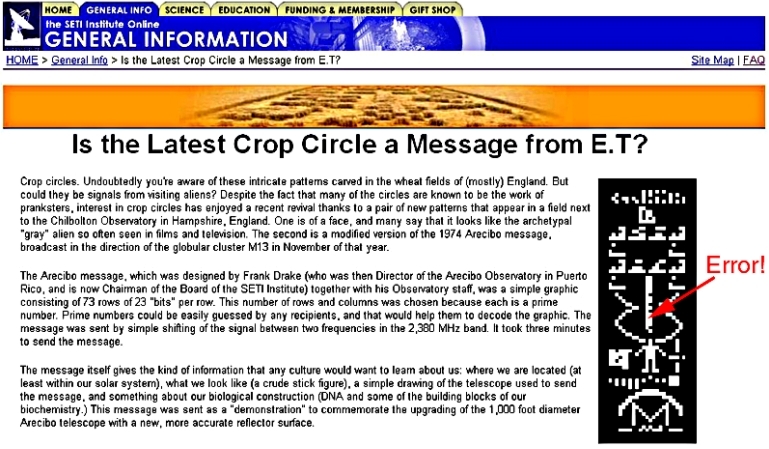 Second: the latest “alien communications in the crops” once again involves the Arecibo Radio telescope, just as the whole EQ Peg scenario actually began with Arecibo’s detection of a false SETI signal in September of 1998 (for, if it had not been for the initial Arecibo “false alarm,” it is highly doubtful that mainstream media - including England’s own BBC - would have been so quick to spread the second report of an EQ Peg SETI signal a month later …). Which - given the extraordinary optical sophistication and execution of this communication in the wheat (below) - raises once again the specter that, if this is NOT a bonafide “ET Chilbolton signal,” the only other likely source (because of the need for high technology) is once again our friends in the intelligence community …. For years there have been rumors regarding the viability of such “exotic” technologies under the intel community’s control. 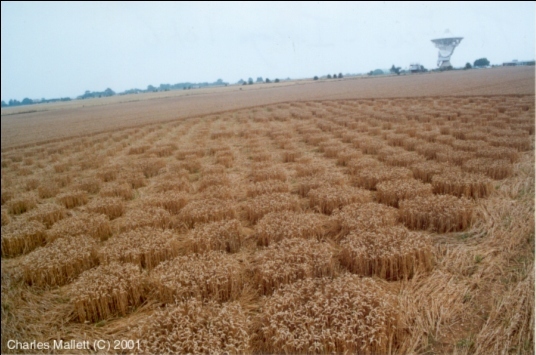 What is lacking, of course, is any proof (we’re awaiting results of crop sample analyses of the Chilbolton glyphs - which would provide evidence of such “high-energy” manipulation of the crop - even as we write …). If it is “intel agents” (and NOT “ET”) - this, of course, brings us back to the crucial question: why? to seed important new information, regarding our own solar system history and our evolution, into the general population - from a “dissident” faction of that intel community. Information known only to a few… and until now censored from the rest of us. The contents and timing of the glyphs - immediately after publication of our new Mars Tidal Model - would suggest that this “someone” wanted more attention paid to the possibilities raised by that new model, to underscore our own collective heritage on Mars. As independent researchers have poured over that original Message and shared their insights across the Internet, it has become increasingly obvious that “something” (though not what some have claimed) was curiously wrong with its construction, 27 years ago. 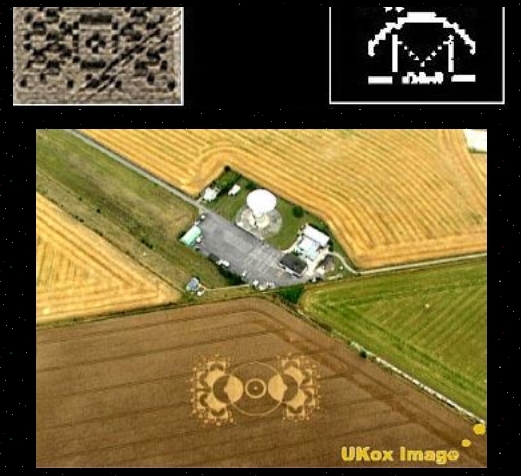 Until the “Arecibo Response” glyph suddenly appeared in the Chilbolton field. Not intended as a “serious attempt” …? That’s not what everyone’s believed (certainly those involved in SETI) for the last 27 years! In fact, many of those present at the actual Ceremony on that afternoon of November 16, 1974 took the event VERY seriously, according to Harold Craft, Cornell's current vice president for services and facilities, who was also physically at Arecibo in 1974. "We translated the radio-frequency message into a warbling audio tone that was broadcast over speakers at the Ceremony. When it started, much of the audience spontaneously got up and walked out of the tent and gazed up at the telescope …"
So, was the “Arecibo Response” at Chilbolton really designed to reveal (through the world-wide attention it would bring) some important “curious inconsistencies” regarding “Mankind’s first Interstellar Radio Transmission?” And, was that in turn designed - after almost 30 years - to make us ask some hard questions about the larger nature of “SETI” itself …? Take, for example, the original scientific paper on the event written by “the staff” of Arecibo (but actually by Drake and Sagan) - which has now come under its own scrutiny, after 27 years. This key description of the historic experiment was duly published after the Transmission, in 1975, in the prestigious peer-reviewed scientific journal, Icarus. Carl Sagan not only was one of the paper’s authors ... he was also the Editor of Icarus at the same time - a fact which shall become highly significant in a moment. The “cartoon” - which had by then circulated around the world in newspapers, television and magazine coverage -– contained several fundamental errors. The most obvious, the central “spine” - denoting the number of nucleotides in human DNA - was missing a critical “0” (below, center). Compared to the actual binary signal that was transmitted (below, left), this represented a specious increase in the number of nucleotides in the human genome of over half a million - a not insignificant error. And, that transmitted binary nucleotide number (below, left) - representing 4,294,966,110 base pairs - was in and of itself also extremely curious… as you will see below. Given the nature of the peer-review process - let alone the fact that one of the paper’s key authors was the journal’s Editor - such a set of obvious “mistakes” is puzzling. 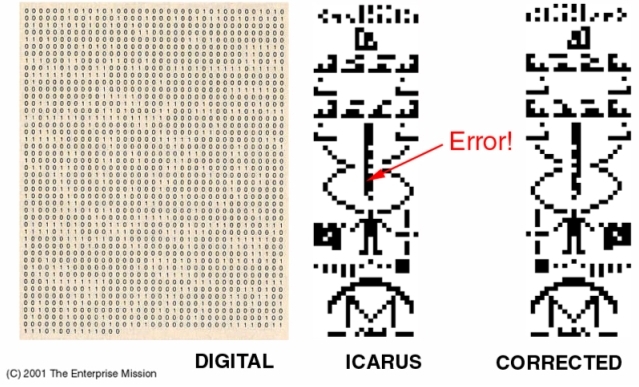 Oh, yes, and this wrong “cartoon” (representing the binary message) was also printed in Icarus backwards… from the actual transmission sequence of the original binary code (above, left and far right). In light of Carl’s extensive biological background, these repeating “errors” are unfathomable. Given his dual position as the Editor of the major scientific journal which published the paper, they are simply inexcusable. Sagan wrote his first published scientific paper, "Radiation and the Origin of the Gene" (1957) while still an undergraduate. As documented by one of his biographers, Keay Davidson (“Carl Sagan: A Life,” Davidson, Keay; 1999), Sagan completed this important paper with guidance from Nobel Prize-winning geneticist H.J. Muller of Indiana University, for whom Sagan worked one summer as a lab assistant. "He knew more about biology than any astronomer I'd ever met, and was fast making a never-before-heard name for himself as an 'exobiologist.'" Which makes these redundant “biological errors” in the Message even more perplexing …. Prior to his highly visible involvement in SETI research, Sagan had been a vigorous proponent of actual interstellar travel and visitations (as opposed to merely radio searches of deep space)! In 1963, he wrote (and had published) a landmark paper on the subject ["Direct Contact among Galactic Civilizations by Relativistic Interstellar Spaceflight," Planetary and Space Science 11 (1963): 485-98], which proposed sending humans to other stars and (long before Zecharia Sitchin) suggested similarly that aliens might have actually visited the Earth sometime in the past. In fact, this was the first paper he sent to me (RCH), after I initially called him at Harvard for some advice in 1964 …. 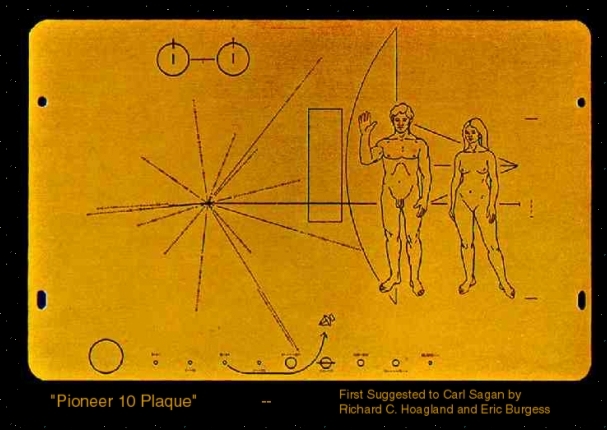 It was one key reason why Eric and I, years later, took our idea for a “message” on Pioneer 10 - destined to be the first physical emissary from Mankind into the Galaxy –- to Carl, that historic afternoon in November 1971. But there are other aspects of Sagan’s diversified background which may give us important new perspectives on how these “Arecibo errors” might have taken place: his now-documented early recruitment into the so-called “black world” of high-level military space intelligence. “In the fierce competition for the Miller Fellowship, Sagan needed an ace, something truly distinctive, something that would make the Miller judges sit up and take notice. So he decided to confide to them information that he was required by federal law to keep secret. He revealed his research at a Midwest institute on the remote detection of lunar nuclear explosions. He must have known the risk he was taking. The information was classified; he had previously cautioned Muller [his Nobel mentor at Indiana University] not to discuss it with others. After all, the cold war was still ‘hot,’ and Washington did not look kindly on the leaking of nuclear information. But the risk was worth taking if it would get him to California [emphasis added]. “The risk paid off. On March 7, 1960, William R. Dennes, chair of the executive committee for the Miller Institute for Basic Research in Science, informed Sagan that he had won the two-year fellowship starting in September 1960 …” had by then circulated around the world. c), he could apparently get away with it! This last point is crucial for what we’re going to explore now …. Given this history, and Sagan’s previously documented eager enthusiasm for actual interstellar travel (as opposed to simply sending signals …), were these “mistakes” in the 1974 Arecibo transmission… actually carefully designed… and by Carl Sagan?! Did Sagan subtly, deliberately - through his “improvements” - clandestinely place classified information in the Arecibo Message (as well as its later publication in Icarus)? 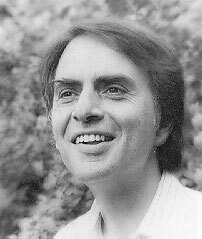 Was this his own “message to the future”… to ultimately reveal to History that he - Carl Sagan - knew some extraordinary “secret,” not generally known to the scientific community or public… a secret that, among other things, one day would also demonstrate the ultimate hypocrisy of SETI? Was Carl - long before the mysterious appearance of a sophisticated “message” at Chilbolton in 2001 - trying to tell us something about real communication with “aliens,” known only to a few in 1974… including Sagan?! This question is not as outrageous as it might seem. “Carl knew I was constructing this [Arecibo] message, and since he was very interested in it, he volunteered to be a proxy extraterrestrial. So one day we went off to the campus faculty club and had a long lunch while I silently laid out the rough drawing of the message in front of him …. He had a few suggestions for improvements, but the message worked. From this first-hand account, by the then-Director of Arecibo himself, we learn that Sagan was the last person Drake consulted… before coding the actual Message into the Observatory’s computers. So, what were those last minute “improvements” that Carl suggested at that luncheon? I’d be willing to bet that one of them entailed the total number of nucleotides in human DNA …. If you carefully examine the central “human genome” section of the original Message, you will count a little over 4 billion nucleotide sequences coded there [by whom? Drake, when recently questioned on this point (see below) said “from a standard biology text”]. Yet, in 1974, the commonly accepted number of these base pairs was “about 1 billion” (see also Francis Crick’s comments, below). Here, then is an undeniable historical record of “multiple, redundant errors” in Mankind’s First Deliberate Interstellar Radio Message - in the original Transmission; in the scientific paper’s authorship on that Message… and in its final editing. Proof that this was not a “one-time error” came quickly… and from Sagan himself. A few months after the November transmission of the Message, Drake and Sagan in May, 1975 co-authored an article in Scientific American titled “The Search for Extraterrestrial Intelligence." In the original magazine (as opposed to the web version) an illustration of the famed Arecibo Message was used (below). The digital version (bottom, right), as we have mentioned, encodes 4,294,441,822 base pairs in the human genome; the “cartoon” version (bottom, left) curiously illustrates 4,294,966,110 base pairs… 524,288 more. Remarkably, in the same time frame (1978), Sagan also published the previously mentioned “Murmurs of Earth” - the official history of the creation of the “Voyager Records” (the spacecraft messages that physically followed the first Pioneer Plaques out of the solar system on Voyagers 1 and 2). And Drake illustrated this “large number” (which, significantly, he didn’t describe further) with the same wrong (too large) binary number used in the original Transmission and in the original Icarus publication (below, left). But, for the first time, it was at least paired with a consistent black and white “pictogram” representing that same wrong number (below, right). A logical inference from this pattern of events is that Drake left the biological aspects of the Message strictly up to Sagan (“He knew more about biology than any astronomer I'd ever met ….”) - only insisting on a consistency between the binary number transmitted and the pictorial version printed in his Chapter. In every other representation of the Message controlled by Sagan, the preceding, inexplicable inconsistency was faithfully maintained… for over six years. So, what was Sagan up to?! If these had simply been one-time “stupid mistakes,” either in the original Message or in the original Icarus “Message paper,” you would have thought that Sagan himself (as Editor!) would have eventually caught them. Instead: he again reinforced that key wrong number - “4 billion nucleotides in the human genome” - in repeated publications that he authored. And, he also repeatedly published - in Icarus and in all subsequent articles - the bizarre, contradictory transmitted binary data side-by-side with the wrong “pictogram.” This forces us to consider the “unthinkable”: that the erroneous encoding of “four billion nucleotides” in the original Message, its repetition in the Icarus paper… and in every subsequent book or article that Sagan wrote or edited about this subject, from 1974 on… was NOT an “error”… but was part of a carefully calculated plan …. This, though far above the official estimates in 1974 (see below) is only 75% of the number that Sagan coded in the Arecibo transmission in 1974. Other current estimates now place it as high as 3.5 billion nucleotides… with a still existing “twenty percent error.” So, the eventual totally sequenced number of actual nucleotides in the human genome (they’re not done yet!) could ultimately reach Carl’s “magic” number of 4.29 billion! 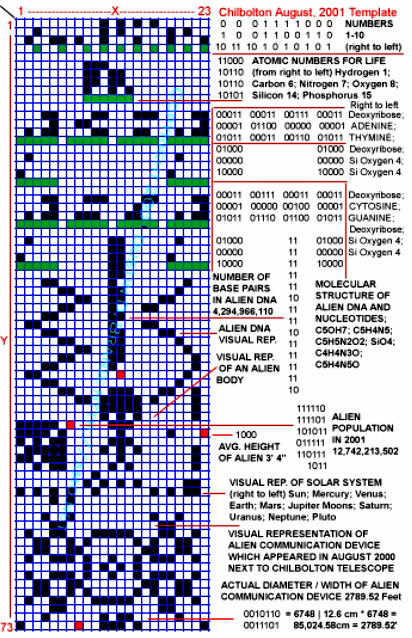 Twenty seven years after the Transmission, in the “Arecibo Response” glyph appearing at Chilbolton in 2001, the “alien DNA” (above the clearly “alien” figure) is pictured as being composed of “4.2949 billion base pairs”… only about half a million more than the precise number Sagan digitally coded in the original Arecibo Message in 1974! But - the “alien” base pair number is exactly equal to the conflicting “erroneous pictogram” that Sagan insisted on publishing over and over and over again. 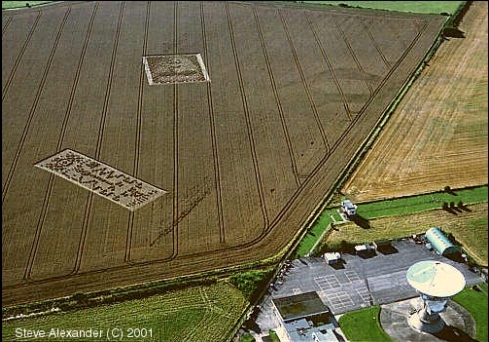 Obviously, he wanted us to pay special attention to that contradiction… and the “alien DNA number”… which has now mysteriously reappeared in an English wheat field, in 2001. Why did Sagan deliberately send the wrong “human” base pair number into space in 1974… a number fully 25 percent larger than that recently-announced, but still remarkably close to the actual “3.2 billion base pairs in human DNA” and counting …? And, why did he illustrate that “erroneous” digital number (in 1974) with another, even-more-in-error “pictogram” in Icarus and elsewhere? And finally, why is the “Arecibo Response” glyph - appearing 27 years after all this happened - now less than 0.0001 percent larger than the “human base pair number” Sagan transmitted toward M-13 in 1974??!! From personal experience, I can vouch for the fact that Carl was NOT a stupid man. Which only leaves the “double agent” explanation …. Where did Carl acquire - over a quarter century ago - such potentially accurate information on the human genome, when no one else in the biological community (see below) could possible know that precise number? Did Sagan - as he had demonstrably done before (when classified information was critical to his agenda) - deliberately use the Arecibo Ceremony as a clandestine means of transmitting a secretly-known human DNA code into space, in hopes of provoking a deliberate response from those out there who already possessed that code?? And finally, was he trying to tell us that a genuine “alien” genome - perhaps the most important to the human species other than our own, because “they” have had the most to do with our own evolution on this planet - was only slightly larger than our own… in fact, closer to us than even chimpanzees or gorillas? And, if that’s the explanation… where did he get his “alien” genetic information??!! Leaving aside Sagan’s precise “source” of this astonishing information for a moment, Seth Shostak - Carl’s “heir apparent,” in terms of carrying on the SETI “myth” - seems now to have taken a page or two from Sagan’s “double agent” play book …. Certainly, Shostak’s misleading public comments re the “Arecibo Response” at Chilbolton, if not his own contradictory actions regarding the original 1974 Message (see below), have only deepened suspicions regarding SETI’s decades-long lack of serious scientific interest in real “messages” …. Evidencing not one whit of scientific curiosity in the striking, inexplicable, geometric figures appearing literally around the world for the last thirty or so years, Shostak instead has repeatedly (and seriously) misstated the facts concerning the “crop glyph phenomenon” in general, and the appearance of the Chilbolton glyphs in particular - both in recent media interviews and in print. And in so doing, he has attempted to perpetuate the myth - successfully launched at Arecibo 27 years ago - that the ONLY means of valid communication with another intelligence is through interstellar electromagnetic messages. Yet, Dr. Shostak - responsible for the SETI Institute’s “public outreach” program - has curiously perpetuated the identical errors in his “debunking” article on Chilbolton that Carl Sagan allowed in Icarus 26 years ago; in his recent rote “defense” of the current radio SETI paradigm, combined with his casually dismissive commentary on the Chilbolton glyphs, Shostak (for some reason) ironically chose the same, erroneous “four billion nucleotides” (and the “alien” version at that!) in the backwards “cartoon” that Sagan used so many years before (below). Further, when informed of this error personally by Dustin Brand (in a recent phone conversation), Shostak has done nothing to remove the erroneous “cartoon” - which he is still representing on the SETI website as the real Arecibo transmission of 27 years ago. In fact, a couple days after his conversation with Brand, Shostak authorized another article on the SETI website, featuring again the same mistaken, “alien” visual version of the 1974 Transmission. Frank Drake is the current Chairman of the Board of the Shostak’s SETI Institute. When Brand attempted to contact Drake directly, to ask him some key questions about these curious “inconsistencies” in the original Message, Drake did not respond. Instead, he had Shostak act as a go-between. The problem is… there were no “standard biology texts” from this time frame, which specifically assigned “4 billion nucleotides” to the human genome! For, in 1962, James Watson, Francis Crick (and their research associate, Maurice Wilkins), shared the Nobel Prize for the discovery of the precise nucleotide structure of DNA. “DNA is a polymer. That is to say it has a regular, repeating backbone with side groups called ‘bases’ projecting at regular intervals. However all the bases are not the same, there are four kinds of them and the genetic information is conveyed by the precise order of the different sorts of bases along the DNA. Given these clearly authoritative references, it has been a real mystery trying to identify what “standard DNA reference” - with the much higher number that was Transmitted - Drake could be “remembering” …. Curiously, six years after the Transmission, in 1980, Sagan himself would publish (in a book called “Cosmos” - from his immensely popular PBS TV series of the same name) a new number for this crucial aspect of human DNA. Clearly, he was not only now providing a conservative range of possibilities (as opposed to the two precise numbers he had previously published), Sagan was now attempting to camouflage his previous, too-accurate assertions. This raises the question: “who” finally tumbled to what he had been doing for the previous six years, forcing him to ultimately appear to support the “conventional” genetic view …? 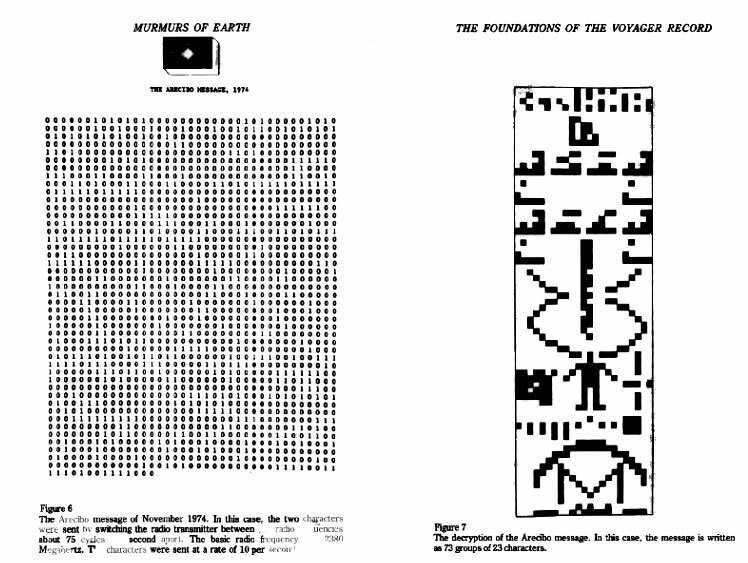 For, later in the same volume, Sagan would reproduce another version of the Arecibo “cartoon” - this one in color, but without the accompanying binary data - and, for the first time, this one would be the correct representation of the binary message actually transmitted… the one that now appears on the official Cornell University website. The one that Frank Drake for some reason still refuses to exchange for the erroneous “alien” version on the current SETI website …. It would certainly appear, from all this, that the creators of the “Arecibo Response” glyph at Chilbolton - whoever they may be - had a well-developed sense of humor… in both their choice of a human interstellar communication to finally “answer” (Sagan’s mysterious “hidden Arecibo Message”)… as well as in their location for carrying it out: in the virtual shadow of an example of the REAL quarter-century “hoax” for practical interstellar communications - a “primitive” terrestrial radio telescope! With intense scrutiny now focused on the contents of that message, and the discovery that some kind of “hidden agenda” apparently went into its construction (What did Sagan say, “… clearly not intended as a serious attempt at interstellar communication …”? ), it’s only logical to also ask “What about the destination? A little research turned up the fact (again, from Sagan himself) that the Message was transmitted on the afternoon of November 16, 1974. 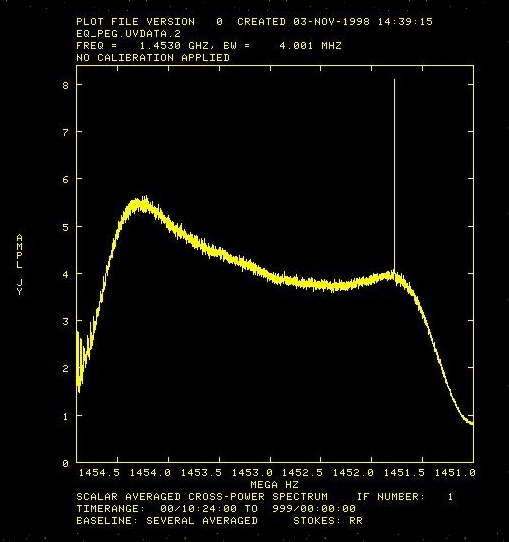 The ostensible reason for choosing M-13 was that it would pass almost directly overhead at that time of year, at the time of the planned Arecibo Telescope “upgrading and resurfacing Ceremony” (the ostensible reason for the Transmission in the first place). 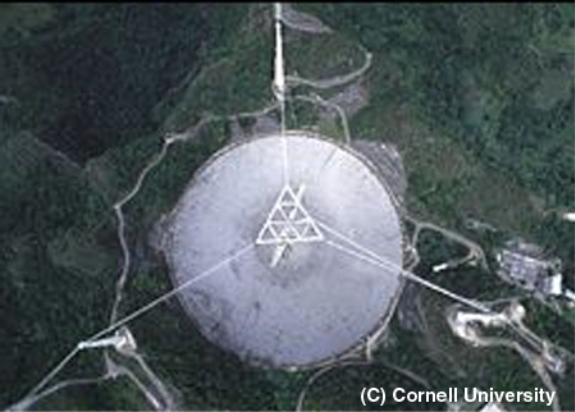 Arecibo’s “dish” is a 1000-foot diameter spherical metal reflector, lying fixed across a water-carved limestone valley (a “karst”) in northern Puerto Rico. Being immobile, it can only view the sky passing almost directly overhead (below). Observations of (or transmissions to) stars and other objects from Arecibo depend on the Earth’s rotation to bring its targets into view across the span of one full day. Specific experiments thus have to be timed for a brief two-hour period (plus or minus ~20 degrees) out of every 24 hours - when these objects pass close to the zenith “pointing” of the movable “feed” of the otherwise fixed reflector. 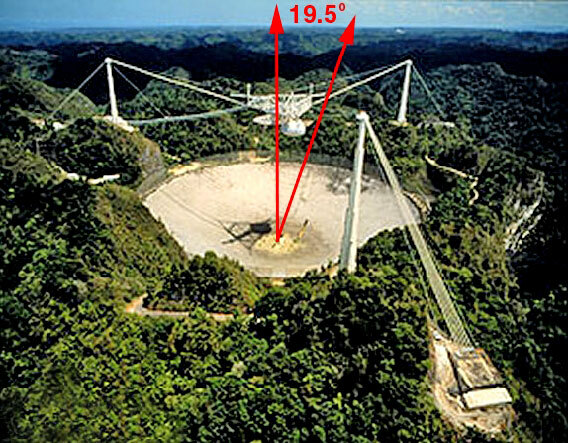 A bit of further research indicated that, beginning at 12:56 PM on November 16, 1974, for two brief moments… M-13 stood precisely 19.5 degrees away from the zenith of the Arecibo Telescope (below) …. In between, starting a few minutes later, from 1:11 PM to 1:13 PM local time, Regulus - the “Heart of the Lion” in the constellation of Leo, symbolizing Mars and Horus - was just setting in the West. 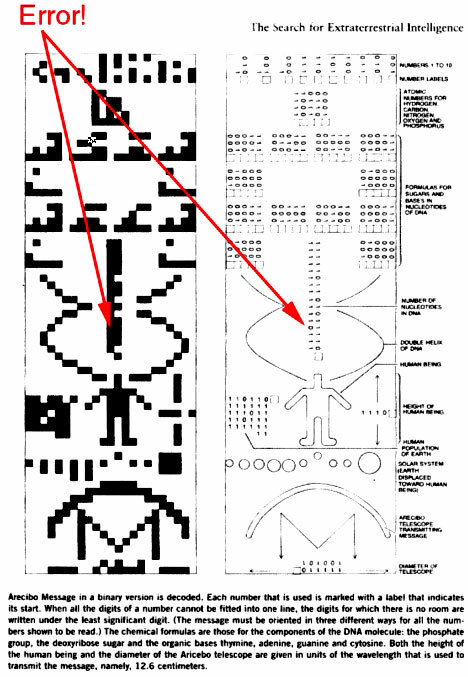 Thus, the Arecibo Ceremony itself (and the hurriedly created and transmitted “Message from Mankind”) was, in hindsight, obviously carefully carried out in direct compliance with the ancient Egyptian rituals that we’ve discovered in so many other space activities... between 12:56 and 1:13 PM, that key afternoon. With its Ritual transmission toward M-13 (Messier 13 - M13, NGC 6205 - also called the 'Great globular cluster in Hercules')… at 13:13 that afternoon (on a string of “Hyperdimensional 13’s …”), the “facade of SETI” was successfully begun. No wonder there were “hidden messages” encoded in its contents: it was obviously designed from the beginning as another aspect of the Ritual - to successfully “capture” the hearts and minds of anyone interested in true interstellar conversations… as the ONLY “practical” (but totally controllable) means of Mankind’s ultimate “connection with the stars“…. Which Sagan (and now, someone at Chilbolton) obviously thought should ultimate be exposed …. Finally, we’ve noticed something else that’s interesting: the first “formal” Message actually delivered into space was on Pioneer 10, launched in the Spring of 1972. 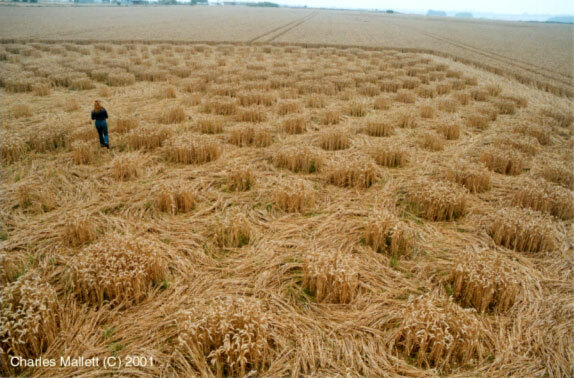 A few months later - in the first growing season after launch - the first modern crop circles began to appear in fields across the British Isles …. Slowly, over succeeding decades - and now in over 70 countries around the world - they have escalated into the thousands, and in a dazzling array of increasing mathematical, geometric, and esthetic complexity and visual sophistication. Shortly after the successful launching of the first interstellar Message that Eric and I suggested (aboard Pioneer 10), Carl published “The Cosmic Connection: An Extraterrestrial Perspecive” in 1973. “In the deepest sense, the search for extraterrestrial intelligence is a search for ourselves [emphasis added]." It seems he meant that… literally. In the short run, it does not matter whether the Chilbolton glyphs are “genuine” extraterrestrial communication… or… the product of an extremely sophisticated “intelligence agency operation” using the same physics (below). The Message - in this unfolding year of the “awakening” of Humankind - is truly ramping up.